I was in Mongolia when this story originally appeared in the news, but I like it too much to not mention it here on the blog. 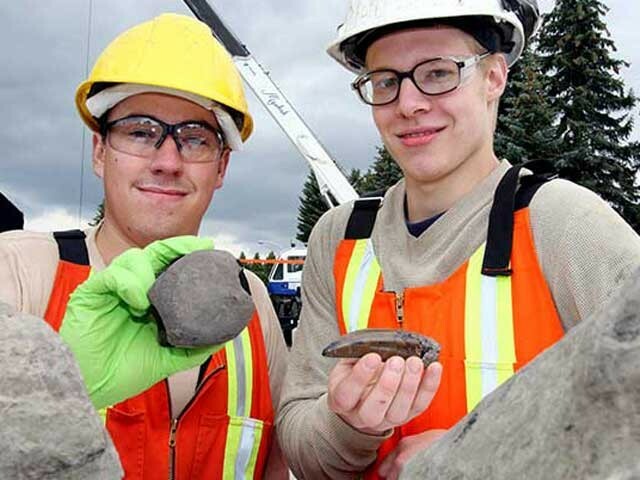 Last August, Edmonton city construction workers were digging a new sewer tunnel when they discovered dinosaur bones! My fellow ankylosaur worker Mike Burns, and Don Brinkman from the Royal Tyrrell Museum helped out at the site for about two weeks, excavating bits and pieces of Edmontosaurus and Albertosaurus. In particular, some awfully nice Albertosaurus teeth were found. Image from the Edmonton Sun. Mike has mentioned that it was a lot of fun to get lowered down into the tunnel each day. I suspect this was quite an unusual excavation experience – we don’t usually work deep underground when digging up dinosaurs! Overall, the material looks quite similar to a bonebed we’ve been excavating in the south of Edmonton for the last several years – dark black shales, and dark black bones. There’s a good chance there’s dinosaurs underneath us everywhere in Edmonton, but they’re covered up by trees and roads and buildings and such. Recent update in the Edmonton Sun. Original articles at the National Post and CBC News. A nice slideshow can be seen at the Edmonton Sun. And there’s a short video about the find at the Toronto Star. ← A visit to the Jurassic Forest. The job of a paleontologist can occur in many different locales. This just proves that “digging dinosaurs” can possibly be a messy job! Sewers, indeed!